Calum Clark insists Saints still have plenty of improving to do after enjoying a stunning first half of the season. 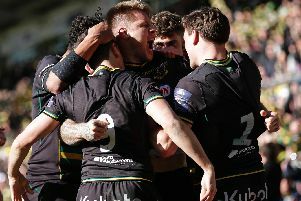 Jim Mallinder’s men are top of the Aviva Premiership and also sit at the summit of their Champions Cup and LV= Cup pools. They have won 14 of their 17 matches and confidence is high at Franklin’s Gardens. But Clark is refusing to rest on his laurels and has urged his team-mates to maintain their momentum as they bid to build on last season’s double delight. “We’re pleased with how things are going,” said the flanker. “We’re in a good position in the Premiership and also right in the mix in Europe and LV= Cup. Saints secured a 30-25 success against Harlequins at Twickenham on Saturday. It was a spirited display that made light of the fact Quins bossed possession. And Clark said: “They rocked us a bit early on but we kept our cool and got back into the game. “We want to compete and be at the top of the table and these are great opportunities. “I’m just pleased that we could rise to it. “We were pretty clinical when we had to be, but it’s a reflection of the sides really. “They keep the ball, move it round a lot and we had to defend well, cover defend well.